Our mission is coupled to political action, and it is necessary to know this before proceeding with GNU-Darwin. We have various help and faq information pages which should be consulted for technical and other assistance. In addition, we have many email lists and web forums for discussing issues related to GNU-Darwin. Moreover, all of the "Read More" links on the top page lead to web discussion forums. A survey of the topics reveals that we interpret the purview of free software activism very broadly, and discussion in these forums is expected to range broadly, not confined to issues that are obviously or directly related to the Distribution itself. A summary of our first three years of operations and the philosophical underpinnings of our activism is available at OSnews, Three Years of Free Software Activism: The Case of GNU-Darwin OS. The founding of the Distribution is rooted in science, and so we try to provide some information which may be mostly of interest to the scientific community. We were also founded in part upon technology from FreeBSD, which has demonstrated broad applicability in the FOSS community, and we try to encompass the implications of that fact, although our heritage is inspiring and challenging. We rely on user input to make this real, so we welcome messages from the community. E-mail us. 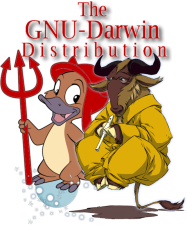 GNU-Darwin has no capital backing and no foundation endowment or other external support, so that our funds are limited to what we recieve from kind donations, contributions of our users and from disc sales and subscriptions. Subscriptions and discs are the best way to get started with GNU-Darwin as well. Instructions about how to get rolling with GNU-Darwin is provided below. Various software services are available, including a full ports install. SMTP access at localhost:25 has also been tentatively added for user convenience. The shell server should be very secure with firewalled, ssh-only access, and this resource will hopefully accelerate development on the Darwin platform. Shell accounts should be considered beta and experimental for the present, due to their long and dubious history on the internet. Of course, we will not tolerate any cracking or spamming activities, which will certainly get the shell account deactivated. Having said that, I think that this will be beneficial to many users who may not have access to a Darwin-x86 machine. It will also be a great demonstration and resource for the Distro and the larger community, and a good way to get to know our users too. GNU-Darwin internet services, now include shell access, total SSL encryption, SMTP-on-LAN, web hosting, web mail, IMAP, virtual domains and flexible subdomains as well. This seems like a killer deal to me for $15 per year with 1 month free trial. It is like a ".Mac for Nerds", but it is also a great example of the compelling work that can now be done with GNU-Darwin. Tell your friends about it. It should be noted that free software means freedom for users. The Distribution by license is not obligated to support the software that we distribute in any way, or to guarantee any functionality. It is too much to ask of an organization which subsists on the efforts of volunteers and generous users, and given that caveat, we proceed. We are grateful to the Free Software Foundation for providing a part of our philosophical heritage, which makes our undertaking possible. In keeping with this principle, we always provide all of the source code for every piece of software that we offer, so that the user will be free to change and copy it for any purpose. Our licencing scheme assures that this freedom remains firmly in place. Our disc offerings are described in our forums and on the ordering page, and many users take the opportunity to subscribe or make a donation when they order. Some start with the OS disc. It does no harm at all to try a test boot on your computer with the OS disc, in order to see if the OS will work with your hardware. You can plan how to proceed from there. After the OS is installed, you will be able to use our packaged software with your system. You will have the satisfaction of knowing that it is a bone fide free software system in total. We offer not only an operating system, but various collections of packaged software. This software should be compatible with any Darwin based operating system, including Mac OS. Many Apple users may not be interested in trying our OS installer discs, but they are often interested in the packaged software, which they can use with Mac OS. We provide free software goodness to them in the hope that they will crave it more and more. Disc sales make up the lions share of revenue for our distribution. If we had other sources of revenue, then we could possibly provide more of our offerings directly on the internet. It is something that we grapple with continually, and some of our offering is under a cloud of debt. For this reason we have decided to include our Google sidebar and a few other bits of advertising on our website. Moreover, although some of our discs are available from other sources, we do not typically link to them or publicize them, so that we can maintain our disc sales revenue. In the spirit of software freedom, we do not interfere or complain when our software is made available elsewhere. It may be apparent that we would like to see equal public access to our offerings, regardless of nationality and other considerations. Moreover, shipping costs have skyrocketted as a result of the war, a situation which is likely only to worsen. For these reasons, we attempt to distribute shipping charges equally among our users, so that users in far away places will have equal access. As a result, users in the US might pay more than they are accustomed to for shipping of our discs. For those who find this burdensome, it may be alleviated by funding our project, so that we can offer reduced rate shipping to everyone like other internet projects.